For other uses, see Yuhuan (disambiguation). 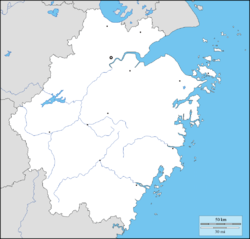 Yuhuan (simplified Chinese: 玉环; traditional Chinese: 玉環; pinyin: Yùhuán) is a county-level city of Taizhou, at the midsection along the coast of southeastern Zhejiang Province, China. Yuhuan, with total area of 2,279 km2 (880 sq mi) including land area of 378 km2 (146 sq mi), has a total population of 392,800 containing a permanent population of 93,000 from other provinces and regions. Yuhuan administers 3 streets, 6 towns and 2 villages, referring to Yucheng Street, Damaiyu Street, Kanmen Street; Chumen Town, Qinggang Town, Lupu Town, Ganjiang Town, Shamen Town, Longxi Town; Jishan Village and Haishan Village. Yucheng Street is the administrative and commercial center of Yuhuan. Fishing boats in the harbour of Xiandie village in south Yuhuan. Yuhuan consists of numerous islands as well as a mainland part. Yuhuan Island is the largest island, and has maximum elevation of 342 metres (1,122 ft). Yuhuan Island is nowadays connected to the mainland with dikes and reclaimed land. Other islands include Daludao (Chinese: 大鹿岛; pinyin: Dàlùdǎo; literally: 'Big deer island'), which has been developed as a recreational area. The island has a network of footpaths and touristic sights, a beach, and a hotel. Zhejiang is known as a manufacturing hub of China, and manufacturing is also driving the economy of Yuhuan. Yuhuan county is one of the most prosperous in the province. It is especially known for its production of valves (some well-known manufacturer such as Yuhuan General Ball Valve Factory Co.,Ltd. and China Yuhuan Mersbrass Co.), automobile parts, and furniture. However, probably the most well-known Yuhuanese brand is "Supor" by Zhejiang Supor Co., Ltd, a manufacturer of cookware. Huaneng Yuhuan Power Station is a large coal-fired power station with 4,000 MW output capacity. This makes it large both in Chinese and global standards. The station ended power shortages, but the locals are concerned about its influence on air quality. Fānshǔyuán (番薯圆), or a sweet potato bun, a local specialty. Due to its location on the shores of the East China Sea, use of plenty of fresh seafood is characteristic for Yuhuanese cuisine. A local variety of pomelo is widely grown, known as buntan in min and wendan in wu dialect. The county has an especially divisive contrast between the local elite and migrants from other regions of China. Most physical labourers and low-wage jobs are held by migrants while most local businesses are controlled in the hands of natives of the county. The county is very diverse linguistically. The majority speak a form of the Taizhou dialect (a form of Wu), while the villages of Chenyu and Kanmen are home to a Minnan-speaking population, whose ancestors migrated to this region from Fujian in the late 1800s. Wenzhounese is also spoken in the region. The three languages are noticeably different and are not mutually intelligible amongst each other or with Mandarin, the official language of China. It is not unusual for a local to speak more than one local dialect and passable Mandarin. ^ Sheet NH51-13, Series L500, U.S. Army Map Service, 1954- Courtesy of the University of Texas Libraries, The University of Texas at Austin.